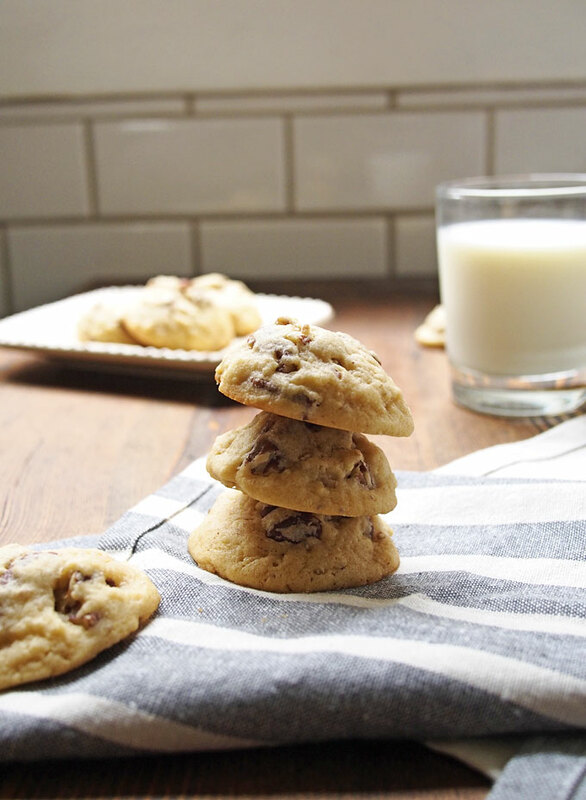 This butter pecan cookie recipe will become a holiday favorite! They’re easy to make and full of classic holiday flavors, everyone will love them! Oh haaay Monday! This month is absolutely crazy, calendar-wise, so while part of me always knows what’s going on, the other part of me occasionally has these “OMG IS CHRISTMAS THIS WEEK? !” freakouts. I’m sure it’s gonna sneak up on my no matter what, but I’m glad we have a few more weeks to eat cookies like these little numbers! In other holiday news, I went to my first Hanukkah party this weekend! It was a tracksuit Hannukkah party, meaning we all wore tracksuits and ate latkes and read “hershel and the hanukkah goblins” together. Thank goodness I still have a purple velour Juicy tracksuit hanging around! Ha! Someone recently told me they don’t even make juicy suits anymore!! I’m not sure it’s true, but either way: I’m holding onto mine for future tracksuit parties! How was your weekend? Are you surviving crazy weather? We’re still getting huge downpours here, and it’s chilly! Everyone I know who lives in the rockies is snapping the insane amount of snow they got — which seems like it was my life not too long ago, even if it’s been two years since I lived in Montana! I can’t say I miss the snow, yet. We’ll see if that ever happens! Let’s talk cookies! 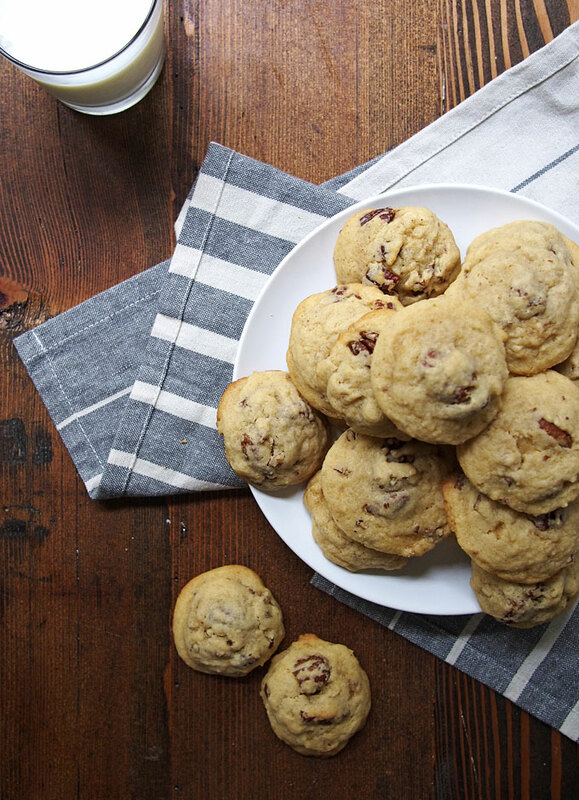 These are simple, soft, buttery pecan cookies! They have the same soft batch base I used for the fresh cranberry almond cookies a few weeks ago, just minus the cranberry and almond and plus pecans! YES! 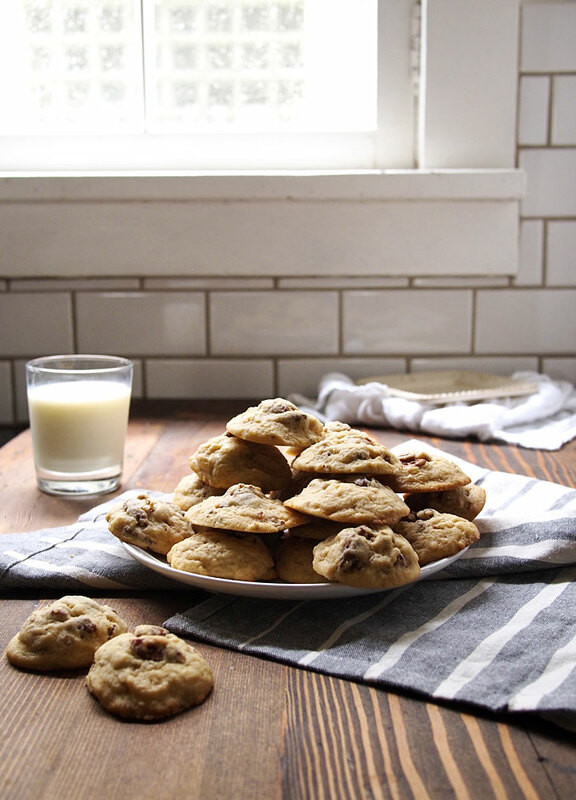 If you’re making this dough in a super cold house, you won’t need to chill the dough… but if it’s normal (like, above 65F) you’ll need to chill it for a little bit before shaping the cookies. These are gonna go FAST — if the consumption rate at my house is any indication — so you might consider making a double batch!! With a mixer, cream together the sugar and butter until smooth. Add the egg, and again mix until smooth before incorporating the vanilla extract. Whisk together the flour, cornstarch, baking powder, and salt before adding the dry ingredients to the butter in the mixing bowl. Mix until the ingredients have just come together, then add the chopped pecans and mix again only to incorporate. If the dough is sticky, refrigerate for 30 minutes (my house is cold enough that this wasn’t necessary). Preheat the oven to 350F, and line a baking sheet with parchment. 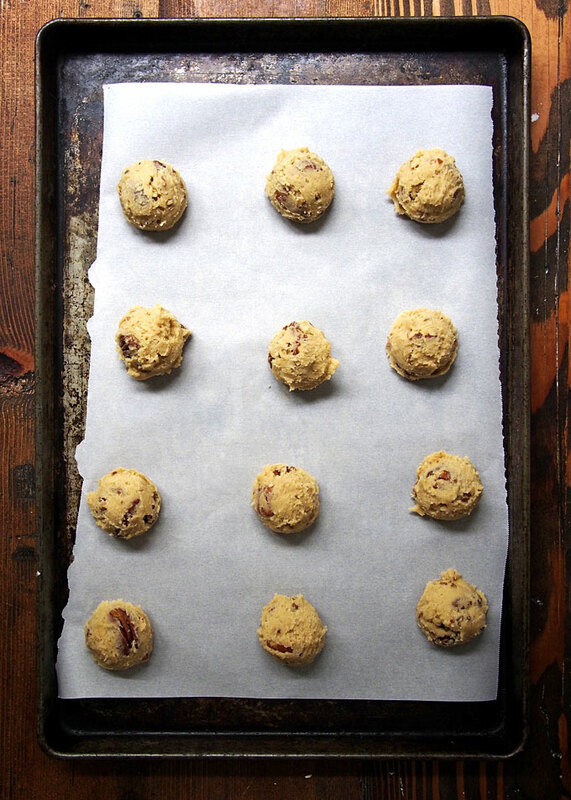 Scoop dough in ⅛ cup balls and place 2″ apart on the baking sheet. Bake for 10-12 minutes, or until the edges are set but not yet browning. They will not look very done! Remove, let cool for two minutes on the pan, and then move to a rack to fully cool. These look like they’d melt in your mouth!! 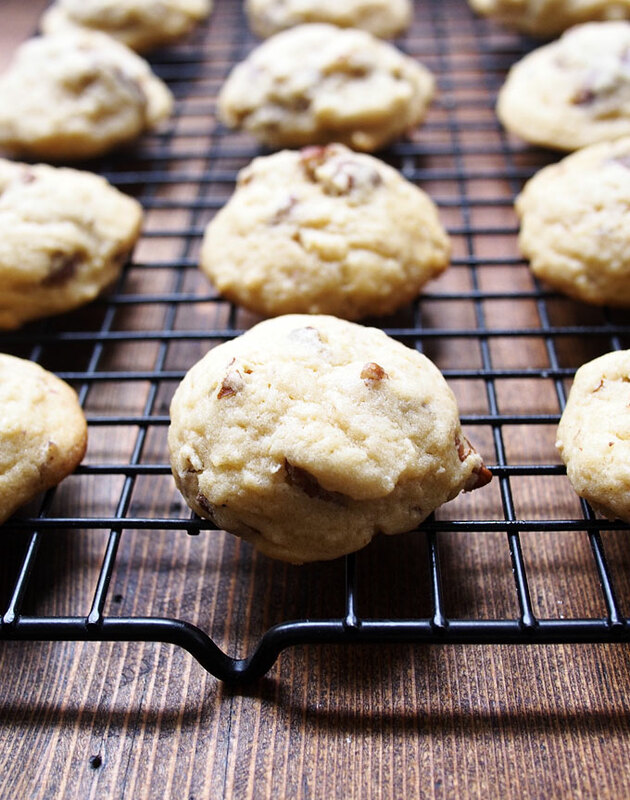 I love a good buttery pecan cookie! Up until recently, I wasn’t much of a cookie person, but I could always, always get down with a butter pecan cookie! I haven’t had one in so long, yours look to do for! I love a short ingredient list like this one! Butter, come to me.